No, this is not a fake picture. This flying saucer is actually resting on a large building in the city centre of Utrecht, The Netherlands. 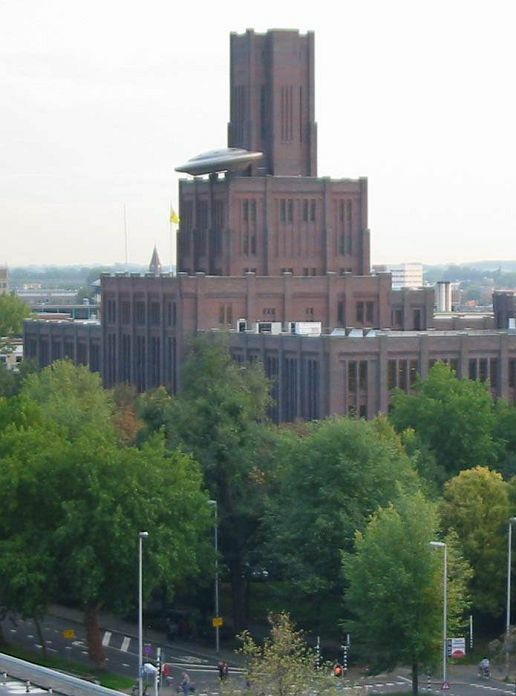 The building is known as the "Inktpot" and accomodates the headquarters of ProRail (Dutch Railways). The saucer itself is an 11.5 mm (37.7 feet) diameter aluminium sculpture, designed by Dutch artist Marc RUYGROK for the "Panorama 2000" open air art manifestation held in Utrecht during the millennium year. It was hoisted up to this position with the help of a construction crane. The saucer is still there to this day (June 2007).